Olympic bronze medallist in judo “Rowdy” Ronda Rousey was victorious in her Strikeforce Challengers 18 debut tonight, though her win did not come without controversy. Rousey defeated Sarah “The Monster” D’Alelio with an armbar in just 25 seconds, but confusion followed as D’Alelio did not tap. After applying the armbar, Rousey indicated to referee Steve Mazzagatti that she had heard a verbal submission from D’Alelio, who denied submitting but did admit to making a pained sound. Mazzagatti did not hear the sound, but stopped the fight anyway at Rousey’s behest and drew the ire of the crowd. Rousey (3-0-0) closed the distance right away in the fight and twice tried to throw D’Alelio (4-2-0) to the mat. When her initial efforts failed, Rousey used a flying armbar to get the fight to the canvas. D’Alelio appeared to make a brief sound, which, according to instructions given to fighters before they compete, will typically be deemed as a verbal submission, but she did not tap. Mazzagatti initially did nothing, but after Rousey looked at him and stated that D’Alelio had submitted, he stopped the fight. Confusion followed as cageside personnel attempted to determine whether D’Alelio had indeed tapped. Replays showed that she did not, and the audio on the replays did not indicate what sound D’Alelio may have made when the armbar was first applied. A dejected D’Alelio was clearly disappointed following the brief bout, but Rousey was deemed the victor nonetheless. Winner: Ronda Rousey by Technical Submission (Armbar) at 0:25 of round one. She improves to 3-0-0. 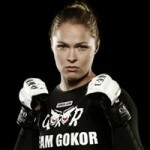 With the quick victory, Rousey moved her professional record to a perfect 3-0. She previously earned three wins as an amateur. Her longest fight to date lasted just 57 seconds and her combined fight time through six bouts is just three minutes and 23 seconds. Four of her bouts, including tonight’s win, have ended in 25 seconds or less, with all foes to date surrendering to armbars. Despite the post-fight controversy, Rousey remains arguably the top female prospect in the 145-pound division and one of the premier prospects in any of the sport’s women’s divisions today. Ronda is still a one trick pony. this was a bogus stoppage totally , i feel for this sarah , girl first she was brought in to lose to gina , then she was used to make rousey look good. come on even rousey should know the difference between someone saying i tap tap or stop and some one grunting through a submission. look at all the reactions of the people sarah was not tapping and never even had any thought of tapping .yah she might of grunted or even said ah but thats quite a bit different that saying stop or tap . mazagatti is an idiot he was out of position and late to get in position to see what happened. sometimes you get cheaters like sonnen and lindland or shamrock with their phoney taps then they say i never tapped ansd then replays show they did . THIS IS NOT ONE OF THOSE , THE REPLAYS BOTH AUDIO AND VISUAL SHOW NO EVIDENCE OF SARAH TAPPING OR INTENDING TO TAP. SHOULD BE CHANGED TO A NO CONTEST AND A REMATCH SHOULD BE DONE. Now, the fighter says when the judge stops the fight? That was awful. To be honest, D’alelio’s elbow bent quite a good deal, but it seemed to me that RONDA was the one who lost leverage (instead of loosing the hold). D’alelio was fighting off the armbar WELL, when Ronda asked the judge to stop and said she tapped, when she never did. I agree there should be a rematch. Ronda didn’t get a good start, as the crowd was booing her and she seemed really disturbed and embarrassed. this man is a joke, pathetic at his job. this is not cooking chips at mcdonalds. this is cage fighting. he should not be in the cage with professional fighters. This is a situation where 50 years ago someone would take him out behind the shed. and yes you know. Zuffa needs to do whatever they can to get rid of this joke of a human from UFC and Strikeforce events. You can’t have someone so inept at his job referring at the top level. The AC’s pick the refs, unless you want the promotions to pick their own guy? which would make it shady.